Ed Stetzer and Daniel Im, Planting Missional Churches: Your Guide to Starting Churches That Multiply, 2nd ed. (Nashville: B&H Academic, 2016). Though I am neither a church planter nor the son of a church planter, I read the second edition of Planting Missional Churches by Ed Stetzer and Daniel Im with interest. Why? Because it raises questions and teaches ways of thinking about the answers that all North American church leaders need to consider in our increasingly post-Christian society. The process of post-Christianization may be further along in Canada, but of late, the United States seems to be making up for lost time. According to the Pew Research Center, the number of Americans identifying themselves as Christians declined from 78.4 percent to 70.6 percent of the population between 2007 and 2014. In that same period, the number of Americans practicing non-Christian faiths grew by 25 percent, from 4.7 to 5.9 percent. The number of religiously unaffiliated Americans grew by 42 percent, from 16.1 to 22.8 percent. Given that 34 percent of “Older Millennials” (b. 1981–1989) and 36 percent of “Younger Millennials” (b. 1990–1996) are religiously unaffiliated, the trend of post-Christianization is going to gain rather than lose steam in the coming decade. To counteract this trend, North American Christians need to plant missional churches. Stetzer and Im define mission as “all that God is doing to bring the nations to himself.” They define missions as “the pursuit of sharing and showing the gospel to all corners of the earth,” that is, presenting the gospel in word and deed. Missional means “adopting the posture of a missionary, joining Jesus on mission, learning and adapting to the culture around you while remaining biblically sound” (emphasis in original). Missional churches, then, understand themselves as missionaries to their respective cultures. The image of missions as “planting” is well known in the New Testament. It is found in Jesus’ parable of the sower (Matthew 13:1–9). Paul uses it in 1 Corinthians 3:6 when he writes, “ I planted the seed, Apollos watered it, but God has been making it grow.” Taken together, these two passages suggest that there should be a relationship between personal evangelism and church planting. A church plant that merely draws existing Christians from other churches is not acting missionally. Church plants should focus on evangelizing those who have not already heard or seen the gospel. 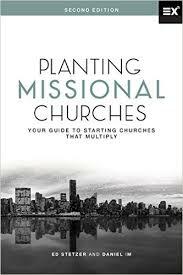 Planting Missional Churches outlines for readers how to do this. Section 1 addresses “The Foundations of Church Planting.” Section 2 outlines various “Models of Church Planting. Section 3, “Systems of Church Planting,” answers questions about systems and structures that should be in place before and immediately after a church plant launches. Section 4 describes “Ministry Areas for Church Planting,” namely, teambuilding, evangelism, small groups, worship, preaching, spiritual formation, and children. Finally, Section 5, “Multiplication and Movements,” shows how church plants can (and should) themselves plant churches. First, to familiarize yourself with the theory and best practices of church planting. Here, the goal is understanding. Far too often, existing churches and church plants are viewed as competitors. This competition can be turned to cooperation when you remember that the goal of church planting is to evangelize non-Christians. Second, either to consider a call to become a church planter yourself or to help your existing church plant other churches. Here, the goal can be either a change in your ministerial vocation or an expansion of your church’s efforts to evangelize people in word and deed. And third, as I suggested above, to better understand what ministry in an increasingly post-Christian society looks like. Here, the goal is to change the mindset of American church leaders so that they think more like pioneer missionaries rather than institutional chaplains. By nature, institutional chaplains have the support of the institution. They can assume certain things about people in their care. Pioneer missionaries can’t assume anything. They must listen and talk to people who do not know and in many cases do not care about the gospel story. So, while I strongly recommend Planting Missional Churches to prospective church planters, I also think it might be a helpful read for established church pastors, whether or not they are considering planting a church. In an increasingly post-Christian society, all church leaders—whether pastors of church plants, revitalized churches, small churches, or megachurches—need to think and act like missionaries…for that is what we in fact are. Just as God sent Christ, so Christ is sending us (John 20:21).